Back in the late 1970s, journalist David O’Reilly stumbled across a mystery bigger than the state of Western Australia itself - wild cats the size of dogs attacking farm livestock! These cats resembled North American mountain lions - also know as pumas, cougars or catamounts - and terrorised the district of Cordering with their presence. 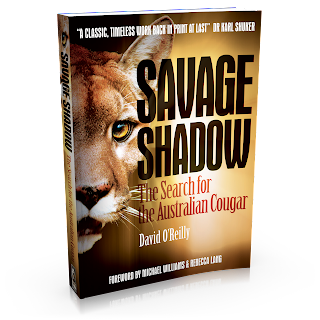 A couple of years after the strange events David put it all together in a book - this book, Savage Shadow: The Search for the Australian Cougar - which would go on to gain status as an Australian cult classic. With few copies available and the story highly sought after even today, a decision was made in conjunction with the O’Reilly family to re-print the book via Strange Nation Publishing. What was really going on in Cordering in the late 1970s? You’ll have to read it to believe it. Part of the proceeds from this book go to a fantastic charity set up in David O’Reilly’s memory - Fighting Chance Australia. Fighting Chance was founded by David’s wife Sue, a journalist and disability advocate, to support young disabled adults. Their youngest son Shane Jesse O’Reilly was born with profound disabilities. Sadly Shane, 21, recently passed away just before Savage Shadow was re-printed. Be sure to visit and join the Fighting Chance Australia Facebook page to find out more.